Experience the unique character of our region, as we explore places off the beaten trail. Click on the interactive map below to find these locations on the go. Harmilda, icon of Harvard’s annual Milk Days celebration of the town’s farming heritage. Our region’s agricultural heritage is still an integral part of this small community in western McHenry County. 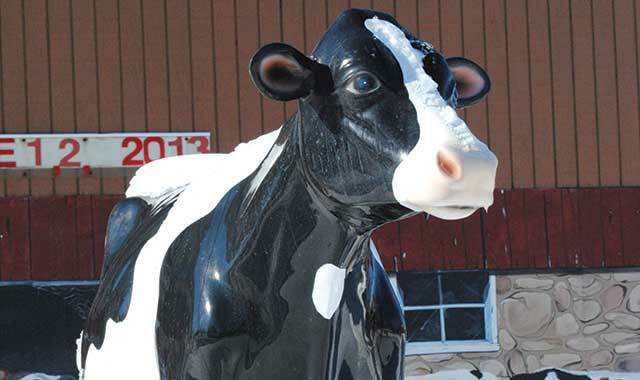 You’ll notice it in the cows that decorate downtown, and at the largest employers in this city of 9,500. Set at the intersection of U.S. Route 14 and Illinois Route 173, this is a community where neighbors and locally owned businesses go out of their way to support each other and to welcome visitors. If you visit on a Friday evening during the fall, the downtown may be pretty quiet by sundown. High school football is a major source of entertainment here, and the stands are filled with local fans. In 2013, the Harvard Hornets went undefeated until late in the playoffs. 1103 N. Jefferson St.
Release your inner cowboy by attending events like calf dressing, saddle bronc riding, barrel racing and bull riding. This year’s rodeo is July 18-19. Milky Way Park, IL Route 173 & Lawrence Road. Located just west of town, Harvard’s third-largest employer supports low food-mile dairy production. Supplied with dairy from nearby farms and jugs from a nearby manufacturer, this producer distributes to local grocery stores. Its production center isn’t open for public tours. 6303 Maxon Road. Gary Pack tends 3,000 acres on the farm his grandparents purchased in the 1950s. It’s best known for its custom-bred, non-GMO (Genetically Modified Organism) Mirai sweet corn, found only in July and August at the farm or at nearby farmers markets. 23017 IL Route 173, (815) 943-7448. Because of its agricultural roots, Harvard is about 45 percent Hispanic. Several Mexican eateries and a grocery store cater to south-of-the-border tastes. Las Rancheritos downtown offers 99-cent Taco Tuesdays. 21 Ayer St., (815) 943-4792. Here, Metra’s Union Pacific passenger rail begins its journey to downtown Chicago, following a route established by entrepreneur and early settler Elbridge Ayer, namesake of the downtown’s main thoroughfare. 1 N. Ayer St., (815) 943-6468. Originally a mass producer of the very first hay carrier, this 1880s-era factory is slowly being repurposed as a venue for social gatherings, wedding receptions and art shows. Local artists can lease private studio space inside, and display their work during the monthly Fourth Friday gatherings, which are open to the public. 300 W. Front St., (815) 943-4805. At the southeast end of the Starline Factory, Jacek and Gretchen Peczkowski display intricate works of handcrafted metal. From garden art and baskets to trellises and gazebos, most of these unique wrought-iron works are designed by Jacek. 208 W. Front St., (815) 943-3465. Set atop a hill on a family farmstead, this Medieval-style castle has turrets and towers. Actually a private residence and bed-and-breakfast, the castle hosts social gatherings, weekend bookings and weddings, as well as occasional public teas. 4504 IL Route 23, (815) 943-5764. This entry was posted on Friday, May 2nd, 2014 at 11:58 am	and is filed under Recreation & Destinations. You can follow any responses to this entry through the RSS 2.0 feed. Both comments and pings are currently closed.